With the beginning of World War II and the sharp increase in transportation tasks, the DRG suffered from a striking wagon shortage. The only possible remedy was the construction of new wagon types in order to increase the load capacity and loading space volume on the one hand and to reduce the necessary steel consumption drastically on the other hand. 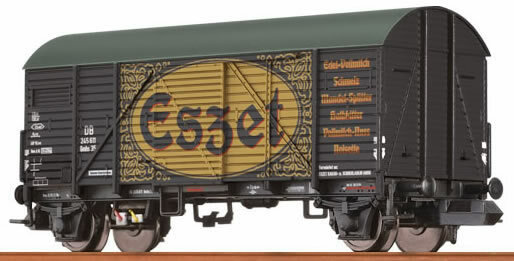 Among others, the twoaxle Gmhs Bremen goods wagon was built as part of these efforts. In comparison with the most recent design, the Ghs Oppeln, the wheel base was enlarged by 1 metre, increasing the loading space by 5 m³. Furthermore, almost 2 tonnes of steel were saved per wagon, pushing the net weight down below 10 tonnes. From 1943 to January 1945, a total of 7,230 wagons were built in this way. 3,440 of them were equipped with a handbrake platform protruding over the buffers on one side, increasing the wagon length by only 100 mm. As a result of the war events, the wagons were spread all over Europe so that Gmhs “Bremen” wagons were found in almost all Central-European countries. The wagons were exchanged between the different railways only in part, and not at all between the countries of the later Eastern bloc and Western Europe.